This is just one of the products I've purchased. Every purchase has been exactly what they said it would be. I started with the free 72 hour kit. It came in about 10 days and it was wonderful! I live on a very fixed income but I purchase as much as I can afford every month. It will pay off in the long run! I've even got my neighbors ordering this food! I ate all the pineapples at one time that how good they are. I don't reconstitute the food I eat as is to find out if its good in case of water shortage. I found that the taste was good digestion good. I'm a vegetarian so will be buying more of these. But have already added other foods as well you never know what you'll have to eat. Years ago I almost bought Mylar bags to do my own the cost was off the chart. Thanks Frank, you're a life and money saver. Arrived on time and in good condition' nicely enclosed in secure plastic tub. Saving food for emergency use so taste and quality not know, but individual packages look sturdy and are well protected by plastic storage container. We’ve ordered quite a bit of your food and have tried some of it. My family loves the banana chips. Strawberries were fresh like astronaut food! Broccoli was NOT a hit dry, but adding hot water and butter and salt, it ROCKED!!!! Green beans are ok dry—super fresh-but more likely to go over w kids once reconstituted. It’s reassuring to know we have tasty food should things ever go south. Thx for all u do!!! Since it is to handle an emergency, I have not opened nor tasted any of the product. I assume it is as advertised. I want to get more soon as I can. I am saving it up for when the stores are empty due to a war or contamination . Just had to try some before adding it to our supply. I love these items, they taste fresh, and I feel better knowing I’m adding essentials to our food stock. I love having these on hand. I use them in cereals in baking and just as snacks. Best I don't have to try to keep fresh fruit till I can use them. I have a grandson who goes backpacking and camping. He said he will use some of his camping food along with your dried food. I suggested he use some of your dry food for his camping needs. Also, have you ever thought of drying beets? I purchased a kit for each of my family members for Christmas. They all loved the gift and the idea, and said they would stock up more for emergency. I only opened one package to sample your product. I liked the taste, but was a little disappointed that quite a few of the strawberries were ground to powder. I guess that is possible when dehydrated food is shipped through the mail. The food and service in getting it is just outstanding. I always order more after trying the food. Especially like the strawberries but all are good and tasty. 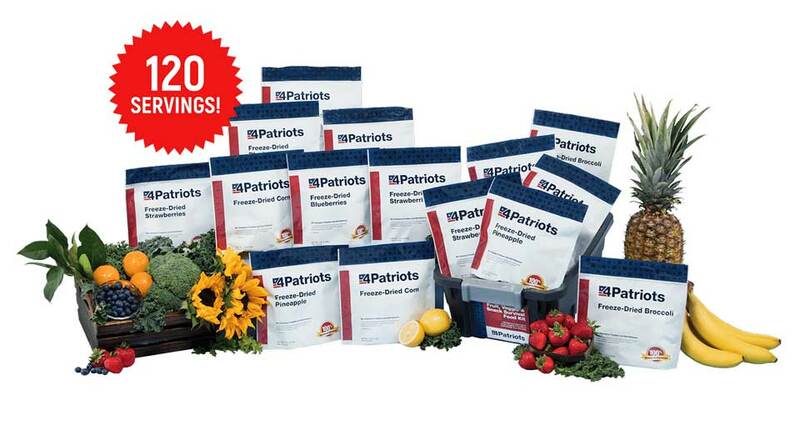 Excellent variety and quantity selection.It is a good addition to my food storage.Thanks. I love all your products! I'm happy with the fruits and veggies but not so interested in the pudding. Now that you are listening..how about adding recipes like your travelers stew w/acorn squash..how about a recipe with the pudding..maybe incorporate it with the pancake mix to make a cake or something???? Other recipe ideas with your food would be welcome. Having choices is important to our sense of control. So when the SHTF, having another source of food choices will help my frame of mind, and reinforce the optimism needed to DIP, or bug out. I have not been disappointed with any of the orders, love them all. The friuts and veggie snacks are great tasting. Keep up the great work! I am very pleased with my purchases of the Fruit & Snack Mix. It's not only great for adults but children today like more fruit as snacks than we did years ago. Much needed item for your storage purchases. RECOMMEND HIGHLY!!! I have ordered many item from Patriots and can HONESTLY say I have NOT been disappointed in anything I have purchased. The food tastes delicious and is easily prepared. The dried food was surprisingly good.